New Rochelle, NY, June 18, 2018–As a key global enabler of the revolutionary genome editing technology known as CRISPR, the nonprofit organization Addgene has made available more than 100,000 CRISPR plasmids (circular DNA fragments) to 3,400 laboratories worldwide. The origins, goals, global reach, and success of Addgene in democratizing CRISPR, which his dramatically changing medical research, are described in a Perspective article published in The CRISPR Journal, a new peer-reviewed journal from Mary Ann Liebert, Inc., publishers. The article is available open access on The CRISPR Journal website. "Enabling the Rise of a CRISPR World" is the collaboration of coauthors Caroline LaManna, Addgene, Cambridge, MA and Rodolphe Barrangou, North Carolina State University, Raleigh and Editor-in-Chief of The CRISPR Journal. The authors discuss the critical need for fast, affordable, global access to the essential tools for performing genome editing. Addgene was already serving as a nonprofit repository where scientists could store plasmids and make them available for worldwide distribution when the tools for CRISPR genome editing were being developed. The ensuing demand for open access to CRISPR technologies and deposition of CRISPR plasmids and next-generation CRISPR tools has helped the technology to advance and flourish. "Addgene has played a major role in the exciting democratization of CRISPR, delivering the tools for groundbreaking gene editing research to investigators in every corner of the globe," says Kevin Davies, PhD, Executive Editor of The CRISPR Journal. "This timely commentary is another example of how The CRISPR Journal is making good on its pledge to become the voice of the international CRISPR community." 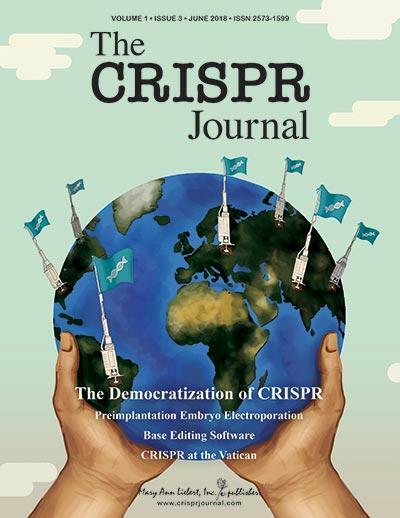 The CRISPR Journal," published bimonthly in print and online, is a groundbreaking new peer-reviewed journal from Mary Ann Liebert Inc., publishers dedicated to outstanding research and commentary on all aspects of CRISPR and gene editing research. Led by Editor-in-Chief Rodolphe Barrangou, PhD, North Carolina State University, the Journal covers CRISPR biology, technology and genome editing, and commentary and debate of key policy, regulatory, and ethical issues affecting the field. For complete information, please visit the Journal website . Mary Ann Liebert, Inc., publishers is a privately held, fully integrated media company known for establishing authoritative peer-reviewed journals in many promising areas of science and biomedical research. The CRISPR Journal adds an exciting and dynamic component to the Mary Ann Liebert, Inc. portfolio, which includes GEN (Genetic Engineering & Biotechnology News) and more than 80 leading peer-reviewed journals. A complete list of the firm's 80 journals, books, and newsmagazines is available on the Mary Ann Liebert, Inc., publishers website.